Hardcover with jacket, 304 pages, 13.5 x 21.5 cm, 5.3 x 8.5 in. The English monarchy ranks as Europe's oldest monarchy. Its ability to survive is amazing: during the almost 1,000 years of its history it has seen a multitude of intrigues and conspiracies at court, religious wars and revolutions, fatally ending love stories, the rise of the nation to become a world empire. From the early Middle Ages down to the present day, famous rulers like Richard the Lionheart, Henry VIII or the Georges from the House of Hanover have all left their mark on the history of England; Elizabeth I and Victoria each had a whole era named after them. 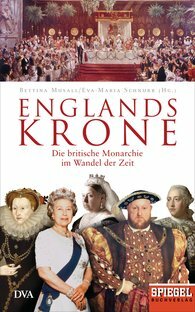 In this book, Spiegel authors and historians give us a closer look at the history of the English crown, from the Anglo-Saxons right down to Queen Elizabeth II. The account centres on the different roles of the monarchy down the centuries resulting from political changes that have left their mark on the English royal family even today in the 21st century.